One of the coolest projects I got to work on last year was YouTube API integration with Call of Duty : Black Ops. The game was a smash hit, grossing over $1B in revenues shortly after launch. Black Ops allows one to upload gameplay video clips directly from the game to YouTube. Below is an example of a clip from Black Ops, as well as the preso from GDC 2011 that I was fortunate to give together with my Activision colleague as a part of the Google track. You can download the slides here. If you missed GDC but are planning to come to Google I/O 2011, we’ll be presenting there as well, so join our session! Agenda details coming soon! This entry was posted in conference, gaming, video, youtube and tagged BlackOps, CallOfDuty, CoD, gdc on April 12, 2011 by jarek. Just got back form Mexico City and thought I’d share the presentation I gave about YouTube APIs at Facultad de Ciencias, Universidad Nacional Autónoma de México (UNAM, Mexico’s largest university) as well as the workshop materials from the developer event at Google Mexico. Both events turned out great, the workshop was focused on hands-on API development, whereas UNAM presentation was a fun API overview with a few interesting examples. I was especially touched with the kindness of the faculty and students at UNAM, I hope to be back there someday. There were a lot of good questions after the presentation, and I ended up staying over an hour longer than originally planned. 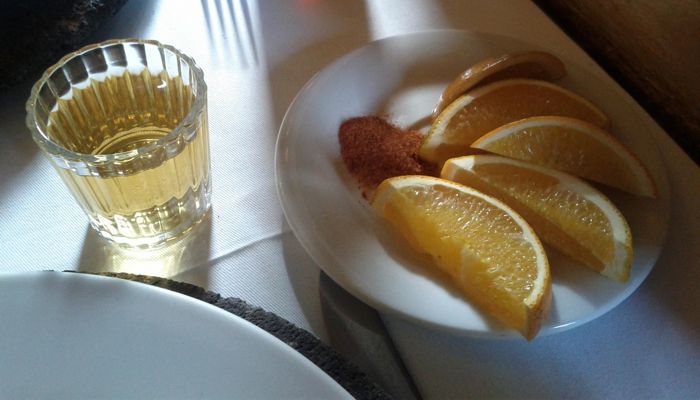 After several busy days in Mexico, packed with presentations and meetings, I enjoyed a glass of mezcal pictured above in Coyoacán, a great place to escape the big city noise without having to go far. This entry was posted in conference, youtube and tagged education, mexico, UNAM on April 4, 2011 by jarek.